I like after-the-rain shots. The air is usually so clear and everything has more clarity. From the waves, it appears that the winds are still blowing a bit, but it must be fairly warm. Nicely done, Jose! i really like this shot jm! love the colors! That's a great spot for a little rest from all the walking. What a lovely shot. WE had some rain over the weekend too, thunderclaps too. Happy Holidays. I always love the water and what a great capture for the day, as always, Jose!! I hope you have a wonderful new week!! Enjoy!! I agree with the others, it's really neat spot to rest. If you like you can link up in this weeks "Through My Lens". Link is below. 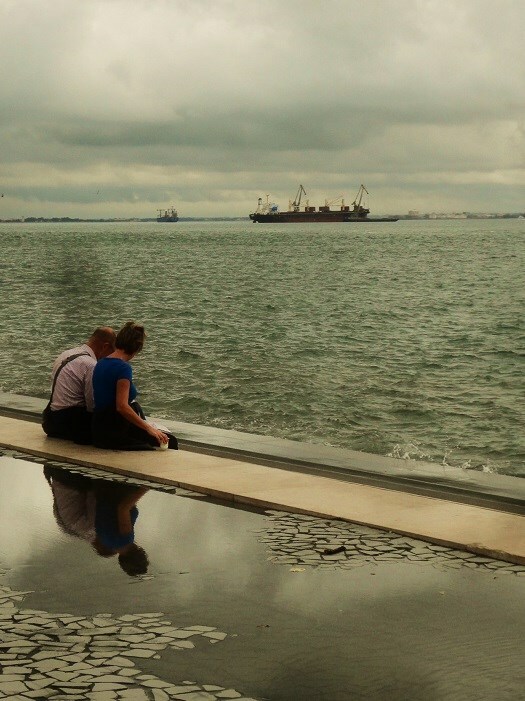 I like to think of it as an old man sitting with his wife and remembering his days of going to sea on freighters... A lovely shot. You have a good eye to have spotted the reflection! Fantastic reflection. I love the muted colors too! Wonderful photo. To sit there, no cold, no matter the raining. Bravo José, a pretty shot !